Ron Cripps arrived at Ventnor in April 1956 as an LAC Radar Mechanic. After subsequent courses of training to J/T (C&R) he returned to Ventnor from the last of these in 1959 only to find it in the hands of the undertakers. He was posted on to Wartling in the September of that year having been based at Ventnor for three and a half years. Ron decided to make the RAF his career and remained in the Service until 1992 having risen to the rank of Wing Commander, serving as Technical Officer and Senior TO in a variety of locations including Buchan and Akrotiri. A remarkable achievement by anyone's book. Ron advises that Squadron Leader Bell was our CO at that time. Ron remembers radar fitter Carlo Money (he of the fine singing voice), Sergeant Jim Money (no relation), Johnny Richards, Sergeant Operator Don Beckly, an Officer Controller John Meader and Gary Hopkins. 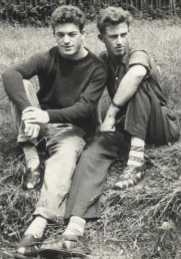 We find that we had a mutual pal in Chas Wickes from Leicester, shown here on the right. Amongst others, Ron has kindly sent in these two photos taken in the Prince of Wales at the demob party held on the evening the author arrived at Ventnor. Are you able to identify any of this tipsy crew? 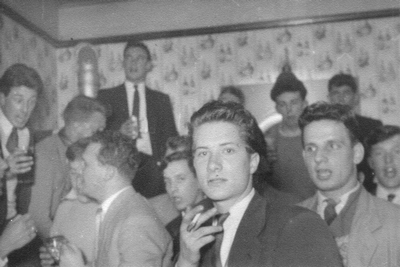 Below we have Gary Hopkins on the left with his oppo Ron Cripps and it was taken in 1956. 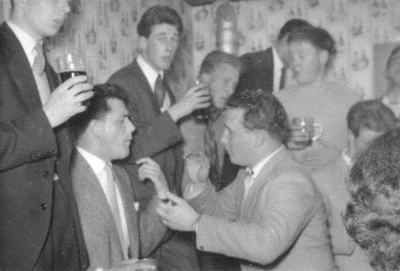 Ron tells me that Gary was a talented Rugby footballer who played variously as firstly a Schoolboy international, then for Weston-super-Mare, the RAF and the Combined Services Portsmouth. He certainly looks tough and it obviously wasn't merely because of the Teddyboy hairstyle alone. Yes, sad to say even the best of us wore sandals like those.